Pumps: Charlotte Russe | Similar-On Super Sale! Ooh I loveee this look. Your skirt is gorgeous :o and love the necklace. 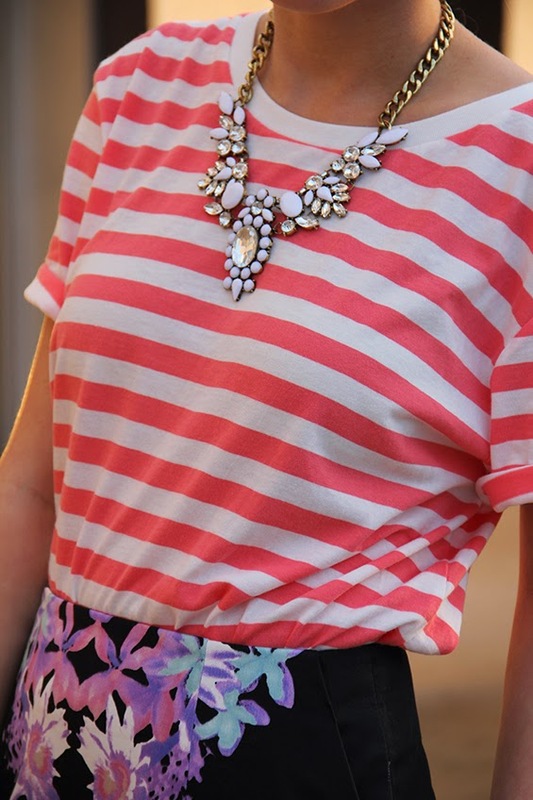 Love the florals and the stripes together! Such a gorgeous look! Great photos too after the rain! I really love your skirt !!! I want one like yours ! This is too cute! I love the print mixing in this outfit :) Cheerful outfits are perfect for stormy days! So cute!! Love these prints together. You need to do a post on how your do your hair. Love it like that. I die! So, so, good... LOOOOOVE the mix of prints! I'm a big fan of pairing stripes with florals! That necklace is a nice touch! WOW! Loved this necklace! When its going to be for sale? Let me know! Hey babe!! My store is finally up! lol It's www.HeyLoveStore.com if you want to check it out! Wow, I think you "win" for most dedicated blogger!! To go out so soon after the storm warnings is kind of amazing!! Cute skirt and really fun statement necklace! i love this outfit! the mixing of the patterns is great!!! Very beautiful look! I love the skirt and your shoes! That's such a pretty skirt. Loving this outfit, and your hair! !